External Affairs Minister Sushma Swaraj announced this in a video. New Delhi: External Affairs Minister Sushma Swaraj today announced a reward of Rs one lakh for helping Geeta, the deaf and mute Indian girl who returned home in 2015 after being stranded in Pakistan for over a decade, in uniting with her parents. In a video appeal, Ms Swaraj said there cannot be a better deed than helping a girl find her parents and urged those people, who know about any family which had a mute and deaf girl who went missing around 12 years back, to come forward. "We will give Rs one lakh to anyone who helps Geeta find her parents," Ms Swaraj said in her appeal. Geeta, who had returned to India in October 2015, has been staying at an institution for hearing and speech impaired people run by an NGO in Indore. "At times she becomes very emotional and starts crying. My appeal to her parents -- please come forward and take your daughter. I am assuring that we will not let her become a burden on you," Ms Swaraj said with Geeta by her side. "We will take care of her including her marriage and studies. Your daughter is desperate to meet you," she said. Ms Swaraj said Geeta could be from Bihar or Jharkhand and requested chief ministers of both the states to ensure that her appeal is shown by all cable TV networks for the next seven days so that people come forward to help her. 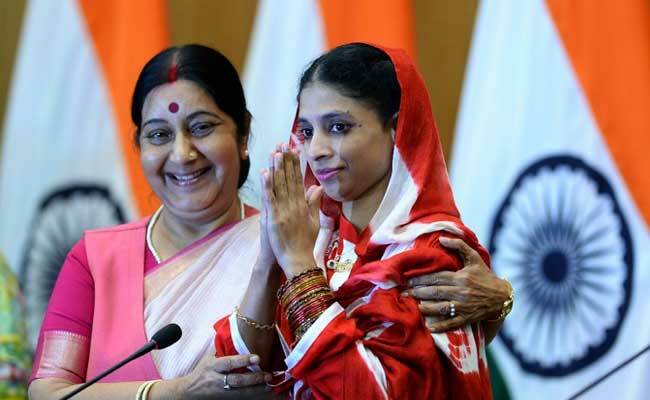 The External Affairs Minister, who had played a key role in ensuring the girl's return from Pakistan, said she had indicated that her real name is Guddi and that the name Geeta was given to her by the Edhi foundation in Pakistan which had taken care of her. After her return from Pakistan, a family from Bihar had come forward claiming that Geeta was their daughter after she felt that they were her parents. However, DNA tests conducted on her proved otherwise. She had failed to recognise the Mahato family after arriving in India though, after seeing their photographs in Pakistan, she had indicated that they could be her family. Geeta was reportedly just 7 or 8 years old when she was found sitting alone on the Samjhauta Express by the Pakistan Rangers at the Lahore railway station. Her story came to light after the release of Salman Khan- starrer 'Bajrangi Bhaijaan' in which the hero unites a mute Pakistani girl with her mother in the neighbouring country.